Published on 9 May 2008. The music industry may find that convincing consumers to pay for legally downloaded DRM protected music is about to get a whole lot harder this autumn, as Microsoft has decided to use its immense tech industry muscle to make an utter mockery of the whole business. 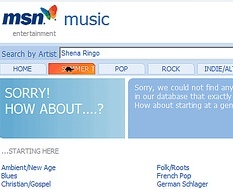 In the wake of iTunes making a huge amount of money from selling DRM protected music, Microsoft desperately wanted to get in on the act, and so set up its own competitor – MSN Music. However, somewhat predictably thanks to the ubiquity of the iPod, the draconian restrictions of Microsoft’s PlaysForSure format, and the complexity of the whole system, Microsoft failed to make much of an impact, and so is now closing down it’s MSN Music store. However, in a move that looks purely incendiary and vindictive, it’s also taking the servers used to validate the DRM licences offline (as reported – with relish – by Googler Mark Pilgrim). Essentially, if you’ve ‘bought’ music from the MSN Music store, in a few weeks’ time you’ll find that any major change to your PC setup – be that changing devices, buying a new portable music device, or even upgrading Windows – will render your music unplayable. So, having taken your money, Microsoft seem to no longer care whether the product works any more. This leaves us with a huge number of unanswered questions, the most pressing of which would seem to be: Will they begin taking the same approach to old versions of software, and stop running software validation servers? Whilst MSN Music and Microsoft Software may be different beasts, it doesn’t seem unfeasable to suggest that this approach to licensing isn’t the corporate philosophy. Most tech-savvy individuals have been aware for a long time that something like this could theoretically happen, but I’d be willing to bet that many thought that Microsoft was trustworthy enough to continue to allow you to access products you’ve paid for. This no longer seems to be the case. It’s the strongest argument yet against DRM, and – for that matter – against buying any Microsoft product. If you’re running Microsoft Software, who knows if the next install will work or if the Validation Servers will have been taken offline? This 1,327th post was filed under: News and Comment, Technology.